The sequel to the popular Twitter client app Tweetie has just found its way onto the App Store. And after spending a little hands-on time with it, I think even old Tweetie users will want to drop another $3 on this completely rewritten app. 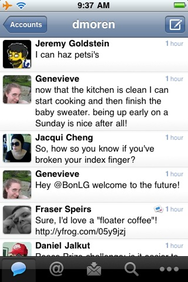 Tweetie 2 boasts a remarkably long list of new features. What words can’t describe, however, is the blazingly fast new interface, which threatens to turn even reluctant tweeters into Ashton Kutchers and Chad Ochocincos. Tweetie 2 includes seamless integration between multiple accounts, nearby map view, and a new offline mode that enables Twitterers to read, tweet, follow, and favorite, even when they don’t have an internet connection. Other app developers have their eyes on Tweetie 2 to see if users will fork out another full retail price for an upgrade. If Tweetie 2 is even close to as successful as its predecessor, don't be surprised to see more app upgrades appear as full-priced sequels.